Aylesbury Choral Society was in fine voice on Saturday in a packed St Mary’s Church. John Rutter’s Magnificat made up the first half of the evening and the choir brought a bright youthful quality of sound to the work. This was enhanced by the positioning of the choir in the south end of the nave which gave both a good view to members of the audience as well as a nice acoustic. 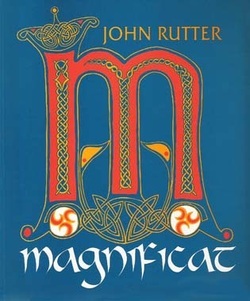 Well loved for his settings of carols, Rutter’s Magnificat was first performed in Carnegie Hall in 1990. He has stated that his intention was to write a Magnificat redolent of Mediterranean sunshine and celebration, evoking the spirit of the many exuberant festivals held throughout Europe in honour of the Virgin Mary. To this end, the work is full of energetic, syncopated rhythms and strong melodies, with more than a hint of the musical theatre from time to time. Much of the piece is placed very high in the range of each chorus part but the choir members approached this with great confidence. On Saturday the choir was joined by Soprano Susan Rann, who fresh from the English National Opera, came as a replacement for Samantha Binnie who was indisposed. Her rendering of the Et Misericordia was particularly lovely, for her voice almost sotto voce, in the surroundings of St Mary’s. carols in medieval and renaissance Europe, which were both informative and amusing. The audience participation was wholehearted and the evening was a great start to the Christmas season.